Super Devaluation of the U.S. Dollar - "Update"
"I had gone to the supermarket to do my normal shopping. As I looked around the store, I noticed there were not that many people shopping as there would normally be. As I started to go down the ailes to buy the stuff I needed I began to notice the prices on many of the items. Coffee, milk, peanut butter and cereals were worth twice as much. Other things like meat, poultry, cheese and other items was maybe two to three times as expensive. As I continued browsing around, I noticed that everything had doubled in price, and some items had even tripled in price. I was shocked at the increase in prices and wondered how the people were going to be able to feed their families." Soon we are going to begin to see an escalation in the price of food, gas, clothing and everything in general. The price of food will go up the most. Everything will be worth twice as much, in some cases three times as much. This hyper-inflation will be the result of the super de-evaluation of the U.S. Dollar which has already begun and will escalate from this point forward. The nation will go financially bankrupt unable to repay its debt. 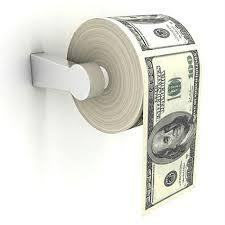 The U.S. Dollar will become worthless. This will impact all the currecncies of the world, not just the dollar. This will lead eventually to the collapse of the world financial system and a NWO Currency will be ushered in. All of you lambs of the Most High need to get out debt as soon as possible while you still can. Everyone of you reading these words, you need to make your calling and election sure. Make sure you are saved; make sure you have repented of all your sins and have been washed in the blood of the Lamb. The salvation of your precious soul is the most important thing. If you are not ready to meet your Savior, nothing else will matter. I had just returned from a trip to Cuba, and was not feeling very well. After prayer, I went to bed early. During the night the Word of the Lord came to me and said three times to me: “They have planned a super de-evaluation to bury the U.S. dollar”. Since I did not understand what the Lord meant by the term “super de-evaluation”, I asked the pastor friend of mine if he knew someone that I could talk to about what the Lord had shown me. He got on the phone and called a brother in his church that has knowledge of financial matters and arranged a meeting. The man told me that it will probably be much worse than the currency de-evaluation of Argentina many years ago. He said it would be more similar to the currency devaluation that took place in Germany and Russia. The Lord also said some other things to me about the church of the pastor I was staying with, and a revival that would take place in the city of Miami in the Joe Robbie Football Stadium. There will be a super de-valuation of the U.S. dollar in the very near future. It will be brought about in order to kill it as the national currency, and replace it with a new national currency or a new world currency. When this happens, it will cause mass panic and confusion, not only in the U.S. but also in countries abroad. The people of God need to get out of debt, and prepare for these difficult economic times fast coming upon us. Ezekiel 7:17-19 "All hands shall be feeble, and all knees shall be weak as water. They shall also gird themselves with sackcloth, and horror shall cover them; and shame shall be upon all faces, and baldness upon all their heads. They shall cast their silver in the streets, and their gold shall be removed: their silver and their gold shall not be able to deliver them in the day of the wrath of the LORD: they shall not satisfy their souls, neither fill their stomachs: because it is the stumbling block of their iniquity."